Royal Jelly is important for healthy skin and hair, Propolis is a natural antibiotic from the hive and will help keep your pet from acquiring parasites and infections, also promotes sweet smelling breath. Kelp is important for maintaining health and is an excellent revitalizer. It can also promote better digestion, healthy skin and coat. 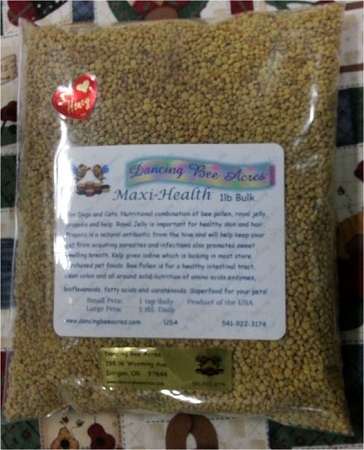 Bee Pollen helps to promote a healthy intestinal tract, clean colon and all around solid nutrition of amino acids, enzymes, bioflavonoids, fatty acids and carotenoids. A real super food for your pets! 1 lb. bag normally lasts approx. 45 - 60 days.